Swarovski Crystal Flatback 2037 Eclipse was newly released in early 2011, as part of their Innovations Spring/Summer 2012. This unique half-circle shape is highly adaptable to a myriad of design possibilities such as circles, waves, flowers, etc. It's clean simplicity and open-ended design makes it extremely versatile for fashion, accessories, and interior applications. Even though, in Swarovski lexicon, the term is "Flat Back", it seems that most people will more frequently spell it as "flatback" (one word). Therefore I will use both terms interchangeably, to mean the same thing. Swarovski Flat Backs are loose crystal elements with a flat reverse side. Generally, flatbacks with no Hotfix on the reverse, have an exclusive Swarovski Platinum Foiling (F) to create maximum brilliance. Flatbacks with Hotfix will usually have an aluminium mirror finish on the reverse side as well as a pre-coating of heat sensitive glue. These are heat-applied (e.g. ironing on) to a wide range of carrier materials. They are durable and long lasting. See more details on Foiling, How to iron on, with Recommended Heat Temperatures. Click thumbnails to have a larger version of the image and line drawings. Please refer the Availability Chart Matrix below for more specifics. To buy Swarovski crystal and findings, why not pop over to my Clearly Chosen Swarovski Store. As a Swarovski authorized dealer (wholesale/retail), I can help you either search for and/or order in for you the Swarovski you need to find. Feel free to use the free Library here to research for some of the hard-to-find Swarovski crystals. 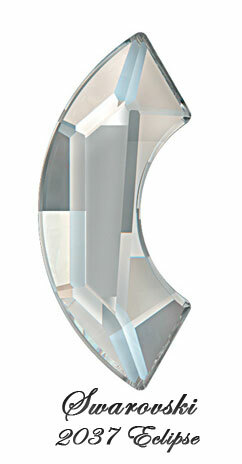 Or Contact Me (new window) - please give me as much specifics as you can when enquiring after Swarovski, e.g. code number, size, color, effect. Please note: apart from what is already in store, I deal mainly in Bulk Packs (¼ of full pack) or Full Packs (full factory packs), direct from Swarovski, Austria). I so happen to have on me some lovely photos of the Swarovsky Crystal Flatback 2037 Eclipse in the latest effect (Crystal Luminous Green) as at Feb 2012. (Photo Credit: CREATE YOUR STYLE). This is sure to whet your appetite so be forewarned! These images apply to both the Hotfix and the No Hotfix flatbacks. Click to view the larger, more delicious image. Have your say! Leave a comment or suggestion in the box below. In conjuction with ClearlyChosen Swarovski Specialty Store, are current authorized CREATE YOUR STYLE with SWAROVSKI® ELEMENTS supplier.